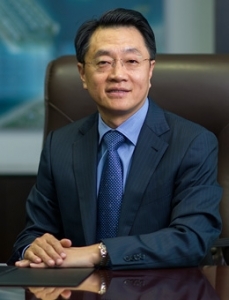 China State Construction Engineering Corporation (Middle East) (L.L.C) is an integrated part and one of the major overseas operational entities of China State Construction Engineering Corporation Ltd. (CSCEC), whose shares are traded on the Shanghai Stock Exchange. In the Middle East Region, CSCEC is one of the region’s largest construction groups with offices in the Kingdom of Saudi Arabia, Kuwait, Bahrain and Qatar. The company’s regional Headquarters are located in Dubai UAE. China State Construction Engineering Corporation is the world’s largest transnational multidisciplinary conglomerate in the field of civil & industrial engineering as well as real estate development, and the No. 1 home builder in the world. In 2016, CSCEC ranked Top 27 on the list of Fortune Global 500 companies. By this ranking, CSCEC has realized its strategic target set in the company’s “13th Five Year” Plan ahead of schedule. With great support from our parent company, we are actively seeking opportunities for alternative/innovative forms of contract including Project Investment, Project Financing, EPC and Design & Build projects. We are dedicated to provide a one-stop service for all elements of the construction process from planning, design, construction to operation and maintenance. In order to achieve our goals, I am supported by a strong team of dedicated and experienced staff and skilled workforce working in our region and site offices already established in Middle East. For the future challenges, we should be firm, strong-willed and spare no effort to diversify our business model and improve the operations efficiency in order to meet our aim to be one of the most competitive international contractors in the Middle East. CSCEC ME commenced operations in the UAE in 2003 and completed its formation on March 26, 2005 in Dubai. CSCEC ME has been active in the region since 2003 when the company was awarded with the Palm Jumeirah Garden Villas Project. In the following 13 years, the company has grown with total contract values in excess of USD 7.0 billion and a turnover accumulated to USD 4.3 billion by the end of September, 2016. During these years, we have become a prestigious and respected company across the GCC which is fully capable of bringing a wide range of projects into reality, such as residential and industrial buildings, public works and various infrastructure developments. We have successfully diversified ourselves from initially being a conventional building contractor to a comprehensive total-solution provider whose business has reached nearly all the sectors of the construction industry in the Middle East region. We are now able to offer our clients with a full range of options from Contracting, Design & Build to Project Financing, across a range of disciplines. At the same time, we also offer Project Investment/Development business. In 2012, CSCEC ME started to integrate all the regional branch offices of CSCEC and has established its Headquarter of the Middle East region in Dubai. Whilst developing the business in the region, CSCEC ME also strives to create a friendly working ambiance to our multinational employees and to get involved in the public welfare of the local society. Training and lecture events are organized for the employees on a regular basis. We actively give support to regional charities which include the Autism Centre, Rashid Centre for Disabled and the Riding for the Disabled Association. In addition at an individual level, our staff sacrifice their time to carrying out community services with local charities to contribute our humble efforts to people with special needs. As per our Mission Statement – “Expanding a Happy Living Environment”, we create values for our customers, our employees, our shareholders and the society. Having deep faith in our commitments drives our pursuit of the sustainable development to the company and society in the region. The CSCEC was founded in 1957 as a state company. Early on the country had an international profile building heavy industry and infrastructure in Asia, Africa, and the Middle East. The predecessor company opened its first overseas office in Kuwait in the late 1970s. The company broke from its regionally confined work pattern when it entered the U.S. market in 1985, opening an office in Atlanta. The U.S. subsidiary began by building housing developments with joint venture partners before undertaking its first sole development, Lantana Lakes, a 107 acre, $27 million complex of 42 homes, in 1987 in Jacksonville, Florida. With the encouragement of the Chinese government and financing assistance from the Export-Import Bank of China, CSCEC has taken increasingly bold steps as a builder and investor of overseas projects. In 2011, the going abroad trend hit a new high when Bahamas Resorts, a $3.4 billion casino and resort built and partially owned by CSCEC, opened after “extremely aggressive” efforts by the company to link with the Bahamas developer that started the project. It was the largest construction project undertaken by a Chinese company outside of China. Working in both domestic and overseas markets, CSCEC has now grown into China’s largest construction and real estate conglomerate and contractor of building works. It is the largest construction company in developing countries and the top home builder in the world. CSCEC has expanded its business to over 29 countries with establishment of 29 branches around the world. From 1982 till now, the accumulated contract value of CSCEC totals 4 trillion yuan with a turnover amounting to 2.3 trillion yuan. CSCEC wins the flagship of China’s construction industry for having the total assets in 2011 exceeding 500 billion yuan. CSCEC has been included in 225 top international contractors since 1984, placing No. 20 in the ranking for 2011, and has made its debut in Fortune Global 500 in 2007, ranking No. 147 in 2011 and No. 100 in 2012. CSCEC is one of the most integrated construction and real estate conglomerates in China with the longest history of specialized operation and market-oriented management. It possesses a complete industrial chain of construction products covering technology R/D, design, construction contracting, property development, manufacturing of equipment and property management. CSCEC is the only construction enterprise in China certified for 3 top grade Qualifications, as well as for “1+4” Qualifications and Grade A Qualification for project design in the construction industry. CSCEC is well known for undertaking super high-rise, super scale construction, cutting-edge and novel projects. It has completed in China and abroad a great number of large projects that are of tight construction period, high quality requirement and challenging work execution. CSCEC adheres to its own business philosophy and brand image that are widely acknowledged and highly praised. CSCEC always considers management, scientific and technical progressing as the engines for its sustainable development. By June 2011, CSCEC had won 8 State Scientific and Technological Progress Awards, 1 State Technological Invention Award, 19 State Good Design Awards, 327 Provincial Scientific and Technological Progress Awards, 127 National Construction Methods and 898 Provincial Construction Methods Awards. CSCEC has also applied for 2,326 and had been granted 1,622 patents. CSCEC, as a central enterprise firmly performs its political, social and economical responsibilities, it generates approximately 800,000 jobs for the society annually. China Construction was successfully listed in Shanghai Stock Exchange on July 29th, 2009, raising some 50 billion yuan. CSCHQ is among the 500 most famous brands in the world. It has acquired over the years a profound corporate culture and an exceptional multi-disciplinary construction practice. It has developed and achieved outstanding standards with Class A certificates issued by the Chinese Ministry of Construction in the fields of roads, infrastructure, and housing construction. Achieve Client satisfaction fully for delivering the quality product in time. Sustain organisational excellence through outstanding technical skills, tenacity, innovative efforts and an absolute commitment on work. Ensure we create safe and hygienic working environments for workmen involved in the project. We treat employees as the most valued asset of the company and recognise that the quality, motivation and performance of our employees are the key factors in achieving our success. Plan, Drive and Implement various contributions to support the local and International societies as a strong belief of the importance of the Corporate Social Responsibility. Our vision is to become the largest international contractor in the Middle East. We ensures to deliver the required quality as per our customer needs. We deliver all our works in a professional safe environment. We highly honor and persist to fulfill all our commitments in delivering the agreed contracts and support our clients. We consider to safe the environment and eliminate any environmental risks that could results from the delivered activities. We contribute by all the available means to enhance and improve the community that we delivers work to.